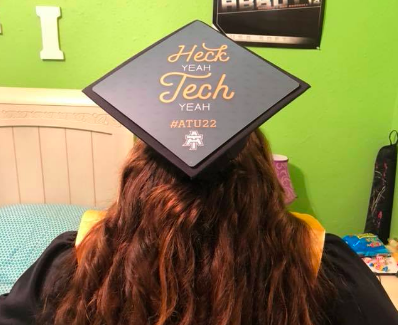 It’s time to admit your Class of 2022! But you’re not the only one. 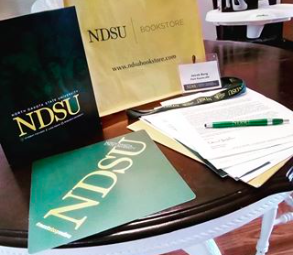 How do you take your admitted student packet from more than just a welcome letter to a memorable experience, making it stand out from your competition? By building an admit pack that increases your yield rate by providing a “Wow!” factor that excites and entices the accepted student to completing the enrollment process with your school. Don’t just send another boring envelope! Sending acceptance letters in three dimensional packaging stands out and leaves a memorable experience. By using BookWear custom packaging you’ll a statement before the box is even opened. Use dynamic and eye-catching images of your campus on the outside, and congratulate your newest admitted students with a sharply packaged admit kit which includes enrollment information and a fun, useful, and visible promotional product. BookWear is printed, packaged, shrink-wrapped and shipped all from one location, making it easy for you! Save some trees! Upload all of your enrollment documents onto a flash drive instead of sending printed fliers and forms. Students can then download what they need and they’ll have a useful promotional keepsake for when they come to campus in the fall. Want to make your flash drive stand out even more? We can turn your mascot into a custom molded flash drive! Being accepted to college is a big step (pun intended), and you want students to be excited! Adding a fun, wearable gift like custom socks adds to the experience of being accepted to your top school. When students wear (and show off) your socks, they’ll be reminded of your school and are brand ambassadors to their peers and community. Peer influence is extremely powerful and no other forms of marketing take advantage of this like promotional products. It’s all put together. Now what? Don’t want to handle the mailing yourself? That’s fine! Just send us your mailing list and we’ll send your admit pack to your newest class. If you want to handle the mailing yourself, we can do that too. We’ll package your Bookwear, wrap and seal it, and ship it to your school. All each box needs is a label, and you’re good to go! Ready to build your perfect admit pack? Contact your Account Manager today! We’ll help you build the perfect admit pack from your school. We can start with the package that was put together for Magellan University, or help you build one from scratch! We’re here to help you make your admit campaign a great success. Pricing for the admit pack as created by Magellan Promotions. Pricing subject to change as flash drive pricing varies on a week-to-week basis. Setup and mailing charges not included. Please inquire. It’s Raining, It’s Pouring… and We’ve Got the Solution! 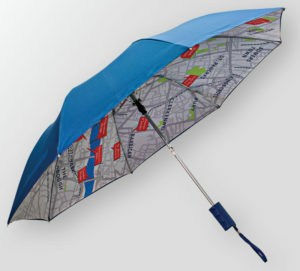 An umbrella makes a great promotional gift because everyone needs one, but who really wants to go out and buy one? 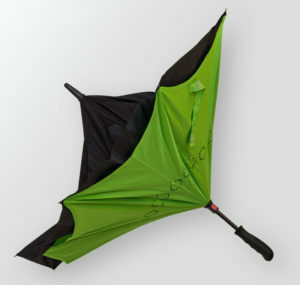 You can also never have too many umbrellas – keep one in the car, one at the house, one at the office, and more! A few weeks ago Peerless Umbrella, our go-to production partner for umbrellas, stopped by our office to tell us about what’s new and trending in umbrellas. Read on to learn more about our favorite umbrellas! 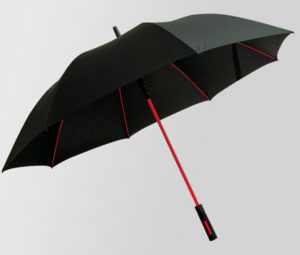 The newest addition to Peerless’ line is the most unique umbrella we’ve ever seen – the Rebel. We’ve all been in the situation where it’s pouring rain as you’re running to your car, and you have to make a quick decision. Do I try to get my umbrella closed as I’m in the car and risk getting my car wet, or do I just get soaked and close it before I get in? The Rebel is the solution to your problem. With an inverted design the Rebel closes away from you, keeping you dry as you get into your car or walk into a building. Click the image to the right to see exactly how it works! We all have seen the basic black umbrella or the standard two-tone umbrella, but are you looking for something that can make you stand out from the crowd? We can help you do that! From a new twist on the two-tone umbrella to a black umbrella with full-color clouds on the interior, we have just what you need to make a unique statement for your brand. Check out our favorite to the left – the Mojo comes in black or navy blue with accented internal hardware in a variety of colors. Do you have a logo that’s too unique for a standard single-color print? How about a picture of a new building or location that you want to show off? We’ve got the solution – a full color umbrella! Pick from folding, fashion or golf for the handle and frame, and an interior or exterior full color print. An added bonus? On some sizes and designs we’re able to print domestically, cutting almost two full months off of production time. It is sure to make your stand out from the crowd on a rainy day! Would an umbrella be the perfect fit for a project you’re working on, or would you just like more information? Just let us know what you’re looking for, and we can present some options that will be the perfect accent for your next marketing campaign. We’re here to make your brand stand out from the crowd, rain or shine! https://magellanpromotions.com/wp-content/uploads/2016/07/2418FC-new-web-2015.jpg 1200 800 Julia Buraczewski https://magellanpromotions.com/wp-content/uploads/2017/04/Magellan-Logo-Websitte-2.png Julia Buraczewski2016-07-19 17:40:222018-01-24 09:35:43It's Raining, It's Pouring... and We've Got the Solution! I bet many (if not all) of your incoming freshmen applied to your school through your website – most likely sitting at a computer. During the next four years of their lives, your students will spend countless hours on their computers – writing and researching papers, completing homework assignments and more. And that’s just the incoming class of 2020. Think about all the ways that your constituents use their computers – students writing papers, alumni making donations and faculty advising their students, just to name a few. 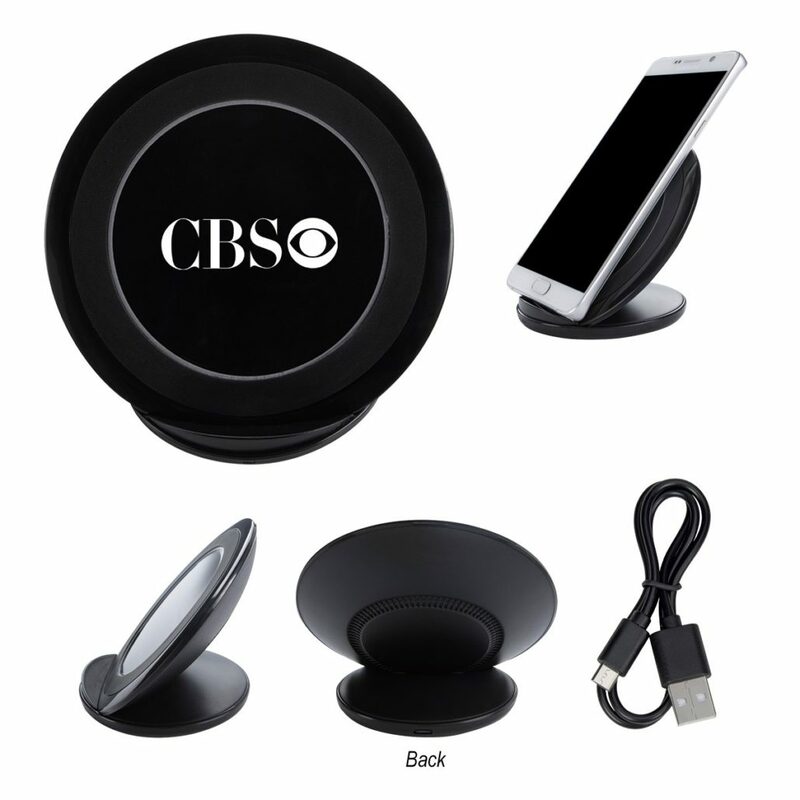 Since computers and technology are such an integral part of life today for your current and prospective students, alumni, faculty and more, what better way to keep your brand right in front of them than by using their own computers as a promotional item? Our exclusively designed keyboard sticker is an inexpensive, engaging and unique way to do just that. 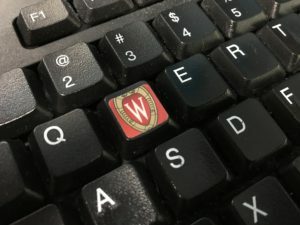 You can customize any computer key with a ½” sticker, quickly making a keyboard the hard-to-miss advertisement for your institution. These keyboard stickers have been a hit with many of our clients and they are the perfect way for you to reach out to current and perspective students, donors, alumni and more. Many schools have used the same template, but do you want to switch it up? We can do that! Add more keys, make a bigger card, or even turn the keyboard sticker into a postcard. If you can design it, we can do it. Email your Account Manager to discuss how the keyboard sticker could be the next great addition to your marketing platform. "We love the keyboard stickers and they remain one of the most popular giveaway items in our office!" Who wouldn’t love to receive a school’s mascot in a toy or stress reliever form? These are two custom mascot promotional ideas that we love! 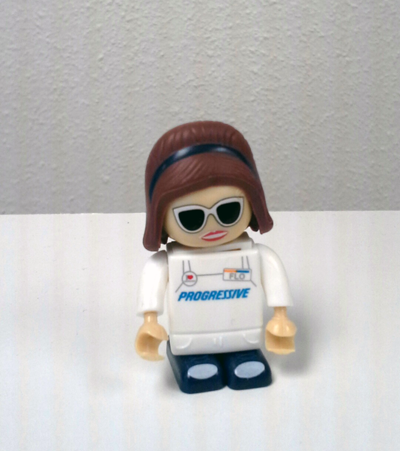 One of our favorite promotional items from the PPAI Expo was the custom building toy mascot, shown below as Flo from Progressive. 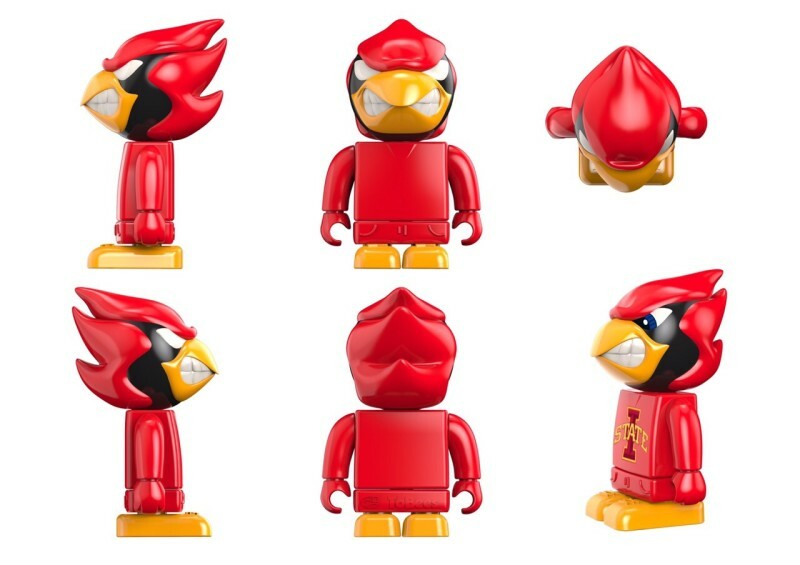 Picture your school’s mascot as a toy figure. Wouldn’t that be awesome?! Here is another example with the Iowa State mascot. Cy the Cardinal, looking rather cute. In just about 90 days our vendor can create the likeness of your mascot in building toy form! Custom orders require a quantity of 15,000 pieces and an up front deposit of 50% of the total project cost. If that quantity sounds a bit high, consider working across campus departments to share the supply of figures. A mascot is a long lasting, enduring symbol of your school, so buying a large quantity of a popular item is a safe marketing investment. If you’re interested in learning more, please contact us. Similarly, a custom shaped stress reliever can be created in the shape of a mascot. Here are just a few stress reliever shapes that were showcased at one of our events. 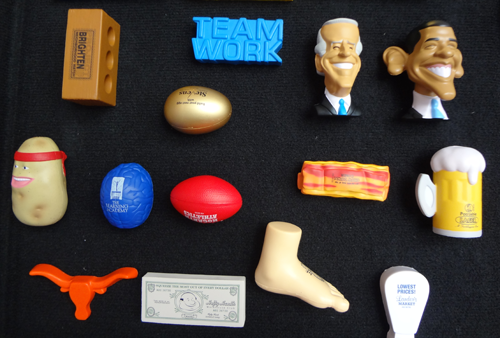 Custom shaped stress relievers include Vice President Biden and President Obama in the upper right corner. To create your own custom stress reliever mascot, only 1000 pieces are needed to meet the minimum quantity. Once a desired size is specified, our partner can provide a quote to create the custom mold. From start to finish, the turnaround time is about four to five months. 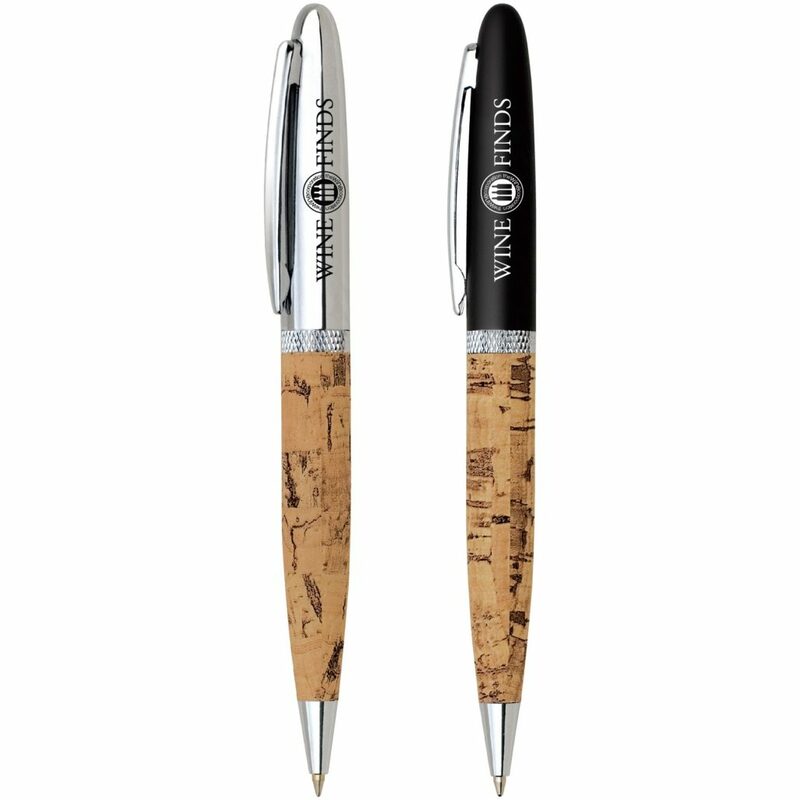 Both of these custom mascot promotional products are very cool and are bound to be hits with anyone who is lucky enough to receive them. With a little advance planning and working across departments if needed, you can create a customized and fun way to share your mascot and school with prospective students, current students, staff, and alumni. 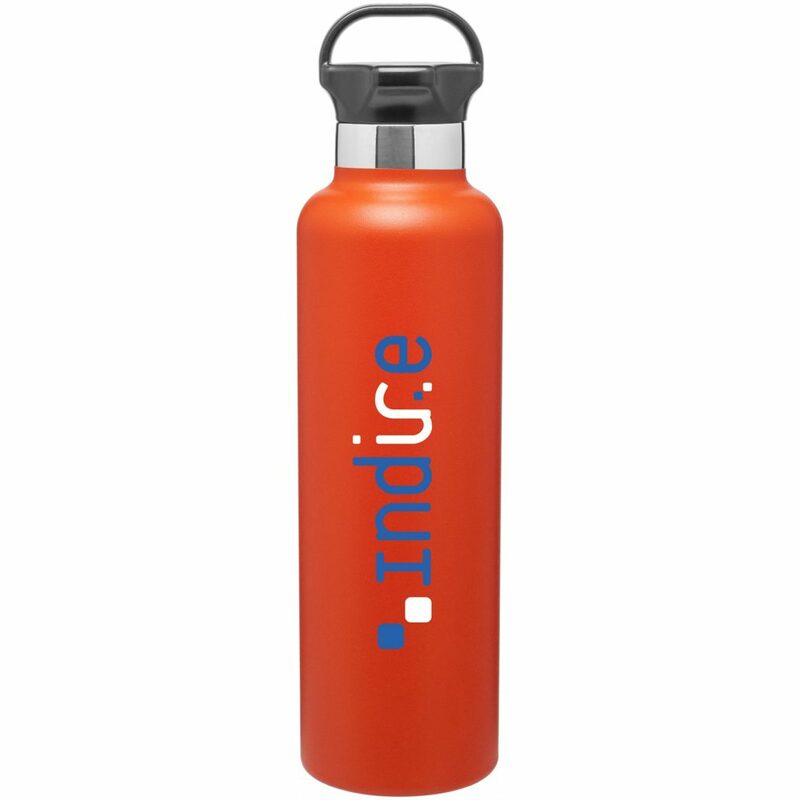 Are you looking for ways to make your logo standout on a coffee mug, water bottle, or glass? Check out these creative imprints to make a statement! The interior portion of a glass or clear piece can be looked at through a reverse view, as shown in the UCLA glass above. We take the logo and provide a reflective image. Both logos are on one side of the piece, so you aren’t having to cancel out logos in two different locations. The UCLA blue logo is viewed across the opposite side of the glass in the left most part of the image. The wrap goes around the piece almost completely with a retail branding of a glossy finish on a matte piece. There will be a small gap, instead of it being a full 360 degree wrap. The gap allows you to place your logo vertically. In this form of design you can take an emblem/crest/part of the logo for the wrap as you can see in the LinkedIn sample. If there is something unique to the company, such as a tire tread, an arch, or just wording of what a company offers, it can be wrapped around the bottle for emphasis, as in the Yokohoma picture. 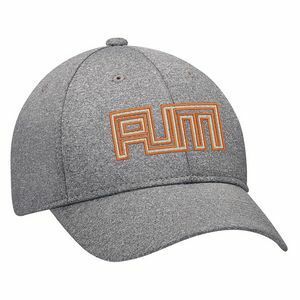 This decoration allows a shiny contrast in a two color design or highlights a logo beautifully. If you want to add a sheen to a logo for vibrancy, then glitz print will be the perfect choice. The sample above has a beautiful, glittery effect! 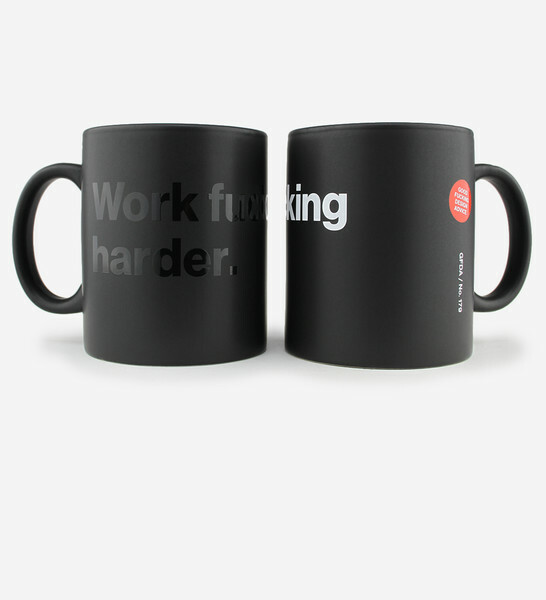 They sell these mugs on their online store with a choice of the tone on tone imprint or white & red imprint on matte black. Now if that doesn’t make a statement, then I don’t know what does! What is your favorite imprint method? Need a specific idea? Just let us know what you’re looking for, and we’ll present options for you to review.